Wayne Gratz has been one of my favorite artists for more than twenty years now, and I had the pleasure of hosting a house concert with him earlier this year. It was the first time we’d met after corresponding for many years, and, other than being a little shorter than I expected, Wayne was just how I had imagined from his music - easy-going, soft-spoken, and a lot of fun. It has been obvious from the themes of several of Gratz’s previous albums that he loves the ocean and nature (except when it’s really cold and windy on the Oregon Coast! ), and his new Four Steps to the Ocean celebrates the beauty and wonder of the sea as only one who truly feels a kinship with it can. This graceful, effortless music captures the feelings of being near the ocean when it is at peace, with gentle breezes ruffling your hair rather than gales blowing your hat half-way down the beach. 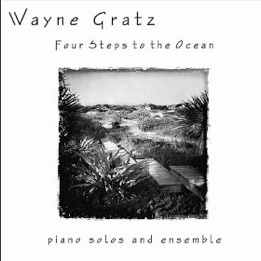 There are no heavy storms or hurricanes represented, but Gratz has done a wonderful job of capturing the spirit of the ocean when it is calm and serene. Some of the fourteen original pieces are solo piano and others have keyboard accompaniment; all are gorgeous, uplifting, and very soul-satisfying. 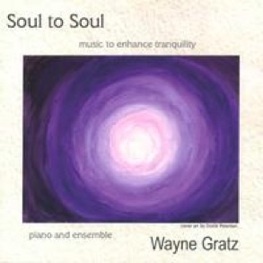 I’ve probably said this with every new release Wayne Gratz has done, but I think this is some of his most beautiful music yet. I can’t really say I have any specific favorites on Four Steps to the Ocean. All of the tracks are exceptional, and I love them all! The first track is “A Silent Wind,” a warm and gentle piece that sets the tone of the album. 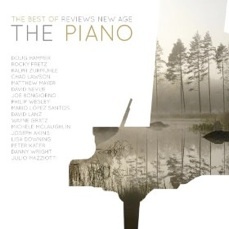 The piano is accompanied by wordless vocals and strings, casting a hypnotic spell that soothes and relaxes. “Drifting” is as effortless as floating on a cloud. “The Painted Skyline” is graceful and a bit more dramatic, depicting the colors that appear in the sky at dawn and sunset - is there anything more beautiful? As its title implies, “Sea Renity” is about absolute peace and calm, with pauses between the notes and lots of open space. “Afternoon Sails” picks up the tempo a bit as it glides along, free from cares and obstacles of any kind. “Easterlies” has a wonderful flow, depicting gentle winds coming in off the water. “Miles and Miles” conveys the wonder of being able to see forever without a clue of where the ocean begins and ends. The undulating left hand effectively describes the constant, tireless motion of the water. One of the joys I discovered moving to the Oregon Coast from the SF Bay Area was that you can take very deep breaths into your lungs without worrying about damaging your body! That refreshing feeling comes across in “Ocean Air” - pure and sweet as nature intended! Four Steps to the Ocean is a quiet, soothing masterpiece, and I give it my highest recommendation. 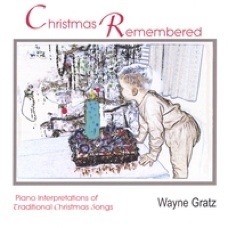 It is available from waynegratz.com, Amazon, CD Baby, and iTunes. Check it out!